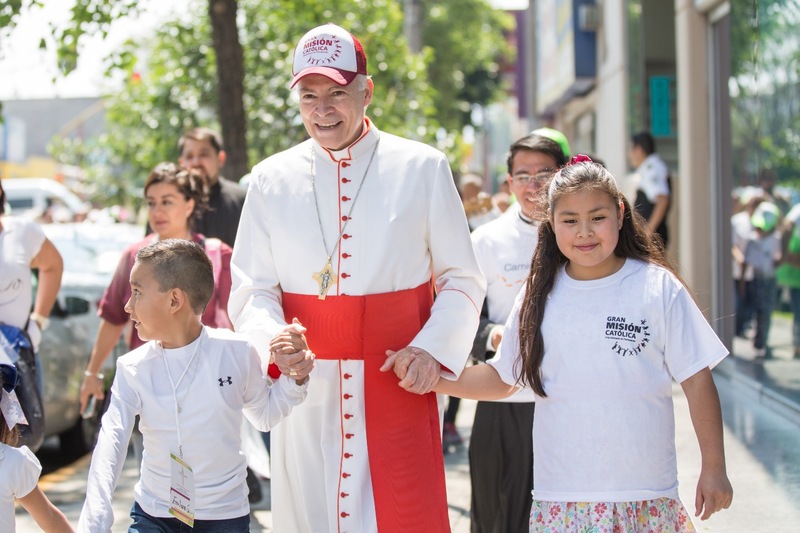 “That is the change we have to make, young people must be subjects of the life of the Church,” said Cardinal Carlos Aguiar, Archbishop Primate of Mexico. In an exclusive interview with ZENIT, after the 15th Synodal Ordinary General Assembly on “Young People, the Faith and Vocational Discernment,” the Mexican Prelate highlighted the main conclusions of this Synod, which he described as “the best,” for its methodology — novel in some aspects –, and for its subject and form, especially its preparation. Cardinal Aguiar pointed out the “capacity that the Church can have to open her areas, to listen, to accompany, and not only dictate what one must do, but to lead one to an encounter with God. That’s going to be the magnificent way of fulfilling our mission with young people,” he said. This native priest of Tepic, Mexico, talked to ZENIT about the burning issues in the Church, which were addressed in the Synod of Bishops: the integration of women in ecclesial organizations, the involvement of young people in the particular Churches, the migratory effect and the “synodality” of the Church, to which Francis calls her. Here is a ZENIT translation of the interview with Cardinal Carlos Aguiar. ZENIT: How did you take part in this Synod? What was characteristic of this Synod? Cardinal Aguiar: From my point of view, it was the best Synod, for two fundamental reasons. The first was the methodology, which was changed, and the second, the subject and the form, the way it was prepared. In regard to the methodology, there was a fundamental change in developing the Synod in parts. Before it was simply by phases, one listened first, then it was interpreted or discerned, consensus was then sought and, finally, there was voting. Today it was done in keeping with the first part of the Instrumentum Laboris, during the first days; the second part, for eight days, and then we entered a synodal process of listening and discussing what we heard; discussing what we heard and, having listened to all, addressing it again in small circles, and then the part to be familiar with of the previous document, to be able to intervene again and vote on it again. What did this mean? It meant that the Drafting Committee, to which I belonged, was able to work on the Final Document practically from the first week: the first part, then the second part. In the other Synods, everything was done at the end, urged by time, with more improvisation, perhaps, of incorporation of the ways and forms. Moreover, it was a work that was done against time, at midnight. Now there was also work at midnight, but by those that print or those that are now involved in the logistics . . .
And, moreover, the Pope gave it a touch — his presence half an hour before beginning the General Congregations, greeting those that were arriving. That was a special touch of the Pope. At other times, he had already come down, giving another sign of having participated; but he wished to be at the door to receive us, to arrive before each Congregation. And, second: He also gave a touch to the first part, which was the hardest, listening to one after the other, one after the other . . . including after that of five participants for four minutes, that is, 20 minutes, three minutes in silence, where we picked up, from what we heard, what had challenged us. And that was very good. Then the atmosphere was very fraternal, very cordial, very much in the process of discernment. And the second reason was the subject and its preparation. It was prepared with a pre-Synod with young people of all the Continents, <which was> very good, which gave rise to the Instrumentum Laboris, which included many instruments of experience, of anxieties and of pointers, and the topic, then, was not so much about concepts and doctrine, but about how to reach young people, and the transmission of the faith, how to effect it with them, in the new generations. Then the pastoral subject always opens our heart more than the doctrinal topics only put on paper. ZENIT: As editor of the Final Document, if you had to mention the novelties in the Document, which ones would you mention? Cardinal Aguiar: Synodality, which includes the three steps the Pope points out: that of mutual listening, of discernment and of decisions; we need to have the structures through which the Church, paradigmatically, is renewed. That’s a key point of the message of the Final Document. ZENIT: The Document states that young people are to be more involved in the particular Churches. How is this going to be promoted? Cardinal Aguiar: Yes, it has to be promoted more, because up to now we have engaged in the action of accompaniment of young people in parish groups . . . but they are mere recipients, “object of . . .” Young people must be subjects; it’s the change we must make — young people must be subjects of the life of the Church. ZENIT: In Mexico, you worked for two years preparing this Synod, with 250 young people from 49 educational centers. What needs of theirs did you perceive? Cardinal Aguiar: We did so in Tlalnepantla. I was still in Tlalnepantla. I didn’t expect the change to Mexico City. I visited, previously, the Catholic and private centers of the area of Tlalnepantla. It took me almost a year and a half. And afterwards there was the Synod, and after that the post-Synod with them, with a subsequent select group, who were about 30. There I verified, and it was confirmed again here, that the men of our time are thirsty for God. And now I’ll give you a fact of Google. In Google-Mexico we were told that the number one search in Google is the religious spiritual subject. And the second is that between them the young people can establish relations regardless of the economic classes to which they belong, something that is very hard for adults. So, the future is there. And the Church has that capacity to relate persons of different classes and economic, social and educational levels. ZENIT: In keeping with the thought of Ortega y Gasset, you commented that social behavior is fractured, conflicting and, because of it, given this change of era, the Church needs to re-think how to act to fulfill her mission. How is this reflected in the proposals of the Final Document? Cardinal Aguiar: I am happy, happy, happy . . .Why? Ortega y Gasset is excellent when he writes how values are habitually transmitted from one generation to another, and how the generations inter-relate whose main stumbling-blocks are the immediate generations, but how useful the adult generations are after one generation with young people, entailing three generations, for example, that are between 15 and 25 years old, with the one that is 25 to 40, where there are difficulties, because they see them as coming competition; then, with much zeal, they close the door to them. Instead, those that are already 40-50 and older, no longer see young people as competitors, but as successors. This analysis made by Ortega y Gasset makes it very clear that when he later says that the advent of a change of era (as he intuited was coming, in 1933), means that we need to prepare ourselves because, in a change of era, the cultural transmission of values breaks, and it affects most the young generation, and the risk is run that it will not assume the values of a culture. Then the effort of young people is double, not only in the general transmission of values, which is always hard for them, whatever the situation, but in a change of era, in addition to <the fact that> it’s hard for them to adapt to the culture, in which we adults were useful to them, now they are confused, because of the fracture of those values, that supposedly are being transmitted to them as great values and they, because of the great cultural fracture, wonder if its true. Up to now they have been mistaken; yes, we will have to coincide with other values. So I’m very happy, because the capacity that the Church can have to open her areas, to listen, to accompany, and not only dictate what one has to do, but to take one to an encounter with God, that’s going to be the magnificent way to fulfil our mission with young people. I saw it in this Synod with them, and I lived it in Mexico, because I was in conversation with all the educational centers, and they are open, rather than being authoritarian and imposing and, in its Final Document, in the third part, the Final Documents posits in fact the need that the Churches, in the dioceses, be synodal and missionary. That is, synodal in walking together, and missionary in going to others. Accompaniment is fundamental, walking together, which is a Synod we, Bishops have walked together here with young people. ZENIT: In point 148 of the Synod’s Final Document, we read that “young men and young women demand forcefully woman’s integration in ecclesial organs at all levels.” What is the situation in Mexico? Is there a real evolution in this connection? Cardinal Aguiar: In Mexico, the Church lives thanks to women. The Church acts thanks to women. The Church transmits the faith and it accompanies it thanks to women. What is lacking, and they do so, are catechists, thousands of women in each diocese. In Texcoco I had some 6,000 catechists in the dioceses and men . . . if they reached 50 <in number> were many. The volunteers to go to hospitals are women. I visited all the hospitals of my area of Tlalnepantla and I’ve already visited five in Mexico City. It’s women who accompany, who are there; who watch over their families and their sick children with so much affection. Women are present for very many family activities, of the apostolate . . . in the different fields. Here, thank God, men come in more, in family pastoral ministry, and it’s also women who are concerned about things they need in the parish; they are the ones who almost always help us to see that it’s clean, who organize the liturgy. The Church lives thanks to their pastoral action. What are we lacking? What do we have to open? <We also have to> open areas of decision-making, in the sense not of simply coordinating a service but being able to be, for instance, a member of the parish Pastoral Council, members of the Council of Economic Affairs in which they are competent, members of the diocesan council of pastoral ministry. And we have them in Tlalnepantla, but I think we have to exercise this more, because sometimes we’ve reduced the role of woman to if she <can be> or not be a priest. The ministry is a service, but it is like a central service for all which lives thanks to all the rest that is done. Is it for us to say that we give a place to women? That they are or are not going to be in the diaconate . . . From my point of view, we must grow in accentuating her incidence in the Church’s pastoral journey. ZENIT: During these days, the Synodal Assembly circulated on the Internet a petition of Catholic women for the feminine vote in the Synod. Do you think women’s participation and voting will be possible in a Synodal Assembly? Cardinal Aguiar: The same as we are asking all the particular Churches to be synodal, it must begin there. If we open ourselves in the particular Churches, that is, that in a particular Church a diocesan synod can be created. However, it must be done in a synodal journey, of every day, daily. It’s what the Synod is asking in its Final Document. If that is done, it will also be possible to think that, not only a Synod of Bishops exists at the level of the universal Church, but <that other> levels will be studied, as the Pope pointed out: the first level of synodality of the Church in particular. We have to begin there, and then God will reveal the steps and ways to pass to the second level, which is the ecclesiastical provinces that form part of the diocese around an Archbishop, on behalf of the Pope. The Archbishop acts for the suffragan dioceses, and the Episcopal Conference, and then the levels of government of the Church. However, my point of view is that we must not, because otherwise we do no more than “clericalize” them and we must, in fact, invert the order; it must begin from life, from the particular Churches. ZENIT: Mexico is the third most transited passage for migrants of the world, and the first of the Americas. Many Catholics support Trump’s migration policy. What must the voice of Bishops and priests be in regard to this issue? Cardinal Aguiar: As Pope Francis has emphasized, our natural condition is that of a migrant. We migrate, because we are passing to transcendence. To migrate, then, is part of the human being and because of it, we have to open our doors always and welcome, receive and accompany. Unfortunately, the migratory problems are increasing . . . For instance, if you are prepared, you can go for work to a country, if you are from the Americas, to Australia; if you are from Europe, to America; if you are from Africa, to Japan and vice versa. If you are prepared, and have the possibility of getting a job, no one objects. Mexico City is growing enormously in the presence of foreigners in Mexico City from all countries. And no one says: “all these migrants arrived, what are they doing here?” What is the difference of one who arrives wanting to emigrate to survive? In search of a better future, but who is not educated, who hasn’t received that human development. Then, what is the cause of migration? It lies in social inequality. It all starts with a lack of education. We, in the Church, have very much to do. ZENIT: The Pope has said that the recipients of the Document are you yourselves, the participants in the Synod. How are you going to take these proposals to Mexico’s Church? Cardinal Aguiar: I believe it’s a responsibility, which those of us who came must motivate. In fact, The Pope said this to us at the end: “You are the first recipients of the document, and you are the missionaries <who must> take it to your own Conferences.” Five of us came from Mexico, and I hope we will be able to transmit it. In fact, the Mexican Episcopate has habitually the custom, after a Synodal Assembly, to make room in the following Episcopal Assembly for those of us who participated to talk, but I believe they must be open to more than information. The document must be promoted. It’s going to be hard, because it’s a strong change, To say that we want to be Synodal Churches is a strong change from the way we have been acting: from a more pyramidal way, of more authority, to distinguish those who decide and those who don’t, who asks the question to a Church where all are taken into account, listening to them, bringing about consensus, and present it to the Bishop . . . etc.